One of my favorite flavors is grape. It is sweet, but not too sweet, and slightly tangy. And refreshing! Grapes by themselves are delicious and juicy. My oldest is really funny about fruit and texture and grapes are on her list of things she won’t eat. When I told her the other day she had to eat 5 grapes, you would have thought I just told her she had to run 10 miles. It was not happening. 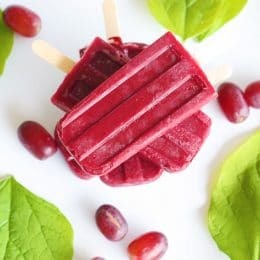 I know that she loves popsicles, and has tried a lot of different fruits and veggies in popsicle form 🙂 This Juicy Grape Pops Recipe did the trick and she loved them! Isn’t it funny how kids will eat certain food just depending on how you serve them? Don’t ever give up! 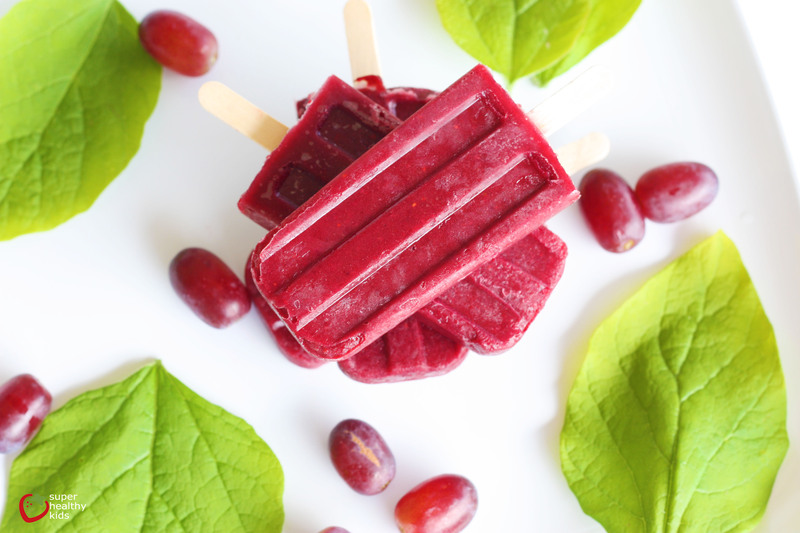 These grape pops may be one of the easiest things you ever make. All you have to do is blend fresh grapes in your blender, then pour into molds! There is a KEY element in making these though. All grapes, even seedless, have little tiny small seeds in them. You don’t really notice when you are eating grapes, but when you blend them up you definitely notice. Also, grapes have a thicker skin on them. 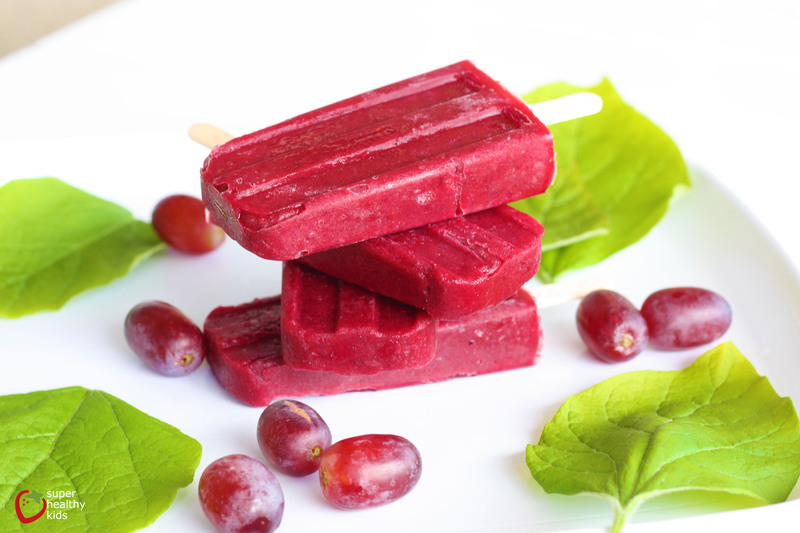 In order to make a smooth, juicy popsicle you really will want to use a high powered blender. I used my Twister Jar from Blendtec and it worked like a dream. You have to have enough blender power to blend up all of the skins and seeds. The skin has fiber and other nutrients so you definitely want to include it! One of our favorite popsicle molds is the Norpro Pop Mold. I like these because you can make 10 pops at a time, and you use popsicle sticks instead of plastic molds. So your molds won’t get lost when your kids are outside with them! We have lots of other popsicle recipes that we like to use these with. Grapes have so many health benefits. Research has shown that grapes of all colors – red, green and black – are a natural source of beneficial components called polyphenols, which help promote antioxidant activity. Grapes have been shown to be anti-inflammatory – grapes can lower our risk of excessive and unwanted inflammation in a variety of ways. We also made a version with berries. 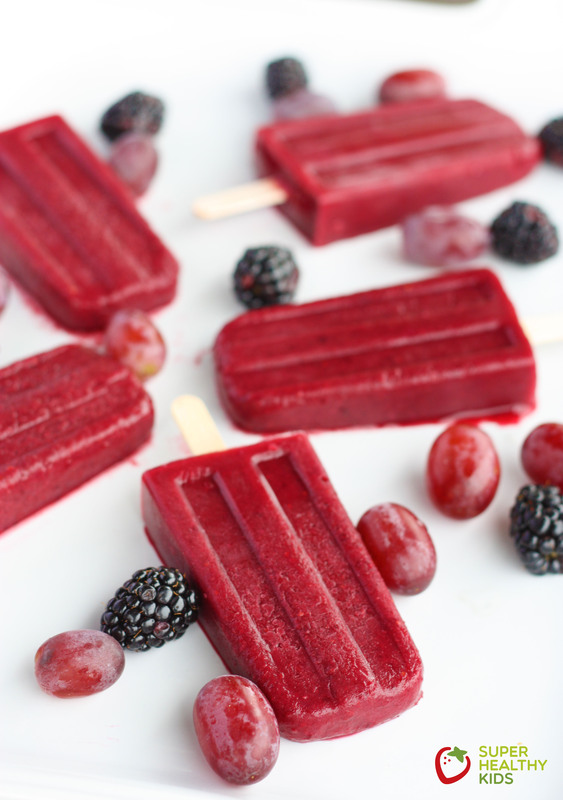 If you want a little more than just grape flavor, add in some berries. We used blackberries because of the dark color, but strawberry or blueberry would work as well! We just added in 1/2 cup of berries with our grapes. Rinse your grapes and pull off the stem. Place in your high powered blender and blend until smooth. So simple! I’ll try this recipe with my son for sure. I love the look of these. Great way of serving fruit. 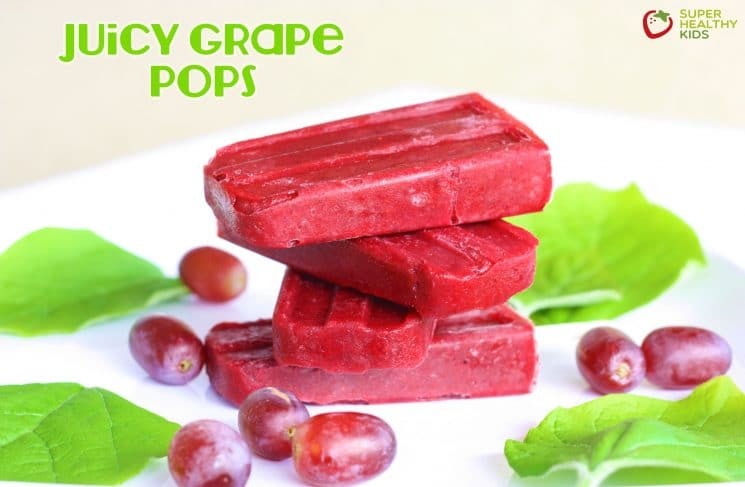 I have also had success with simply keeping the grapes in the freezer and offering them frozen – it intensifies the flavour and changes the texture. I love them like that and it saves me from eating the whole bunch in one go!